We carry a wide selection of AirSep accessories. Please call us at 1-877-774-9271 if you have any questions. AirSep is one of the leading brands in oxygen therapy, with some of the best smallest portable oxygen concentrators, as well as dependable low dose and high dose home oxygen concentrators. It's for this reason that we offer you the accessories necessary for running your AirSep Focus, Freestyle and Freestyle 5. We carry accessories for the Focus, Freestyle, Freestyle 5 that include the AirSep Focus Battery, AirSep AirBelt with Battery, AirSep Freestyle Universal Power Supply and more. We offer the lowest online prices on AirSep accessories and always have inventory that ships same day. AirSep has created a few of the best small portable concentrators on the market. These models are the Freestyle, Freestyle 5, and the Focus. Several of these models can be used with the same accessories, such as the supplemental battery belt. These amazingly small portable concentrators are also very powerful and versatile for their size. The Freestyle 5 is the largest of the three, and it only weighs 6.3 lbs! We make it as easy and inexpensive as possible for you to stock up on and replace the important accessories needed to use your AirSep portable concentrator. 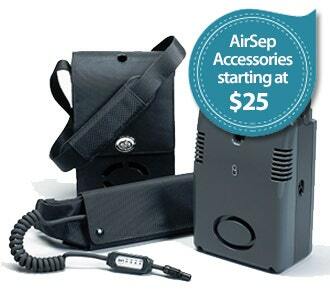 The AirSep accessories are great, because you have a few different options to choose from. Everything from AirSep supplemental batteries, carry cases and bags, and special battery cases. Whether your AirSep portable concentrator comes with an internal battery or micro batteries, it's still wise and often completely necessary to purchase supplemental batteries, as well. This is important, because you never know when you will need them. If you plan on doing traveling, you will definitely need supplemental batteries. Your options are the AirBelt, which is compatible with all of our AirSep portable models, as well as the Focus battery pack. Internal batteries will need replaced professionally when they can no longer charge up to 100%. This usually happens after around 300 recharges. This goes for the supplemental external batteries, as well. Once their duration has gone down, you know it's time to buy a new one, or have it replaced. You can charge your AirSep portable concentrator while running it at the same time with the DC power supply. This will save you a lot of time when you reach your destination, and your batteries have charged up. Having a different DC power supply in each vehicle you will travel in is a good idea. Not only will you help them last longer and cut down on wear and tear, but you won't risk forgetting the only one you have in your other vehicle. You'll need a carry case to carry around your AirSep portable oxygen concentrator. Since all three of these models are so small and light, using a mobile cart is unnecessary. The carry bag will protect your concentrator from the elements, as well as make it comfortable and convenient to take it with you wherever you go, along with your accessories. When going on vacation, taking along extra external batteries is a must. You'll definitely need extras if you're traveling by air, or any other form of public transportation. You'll also want to charge them up all the way before going out and about. Keep some extra, already fully-charged external batteries in the car if you're visiting friends. Keep them cool and dry and packaged separately. Thinking and planning ahead is important when it comes to your oxygen therapy. The Freestyle and Freestyle 5 have small air intake filters that must be changed every 6 months. Stock up on these so you will always have them when you need them.